This Sunday, May 8, I organize a mountain trip already planned on Sunday. Meet at 8:00 am to Moellesulaz. 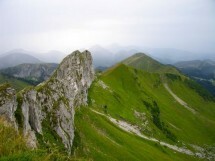 In the French Chablais, Pointe de Pelluaz (altitude 1908 m) is located in front of the Dent d'Oche. From Vacheresse (55 km from Geneva), we walk on a panoramic summit. A circular hike. Price 5 Euros including insurance. Transport: passenger pays 11 Euros to the driver. A gradient of 1100 m and a distance of 14 km. Walking time: about 6 hours.